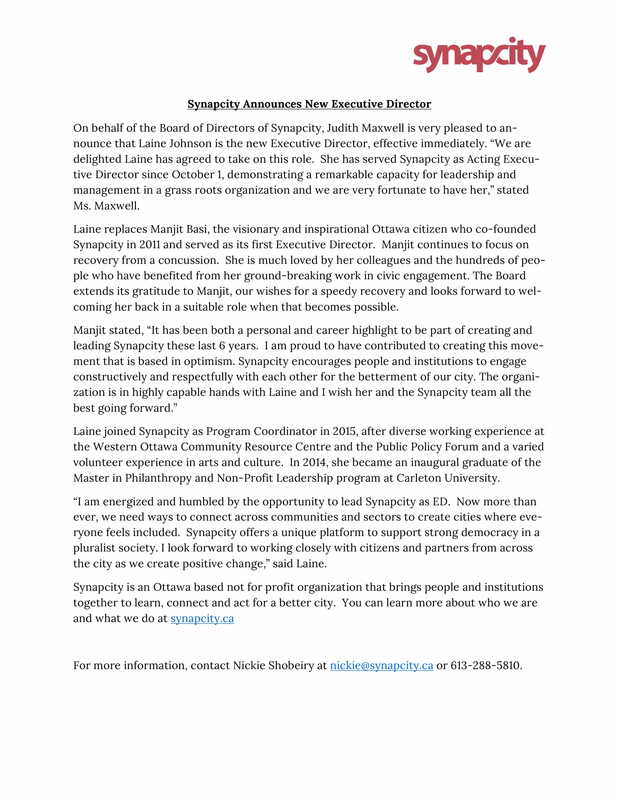 On behalf of the Board of Directors of Synapcity, Judith Maxwell is very pleased to announce that Laine Johnson is the new Executive Director, effective immediately. “We are delighted Laine has agreed to take on this role. She has served Synapcity as Acting Executive Director since October 1, demonstrating a remarkable capacity for leadership and management in a grass roots organization and we are very fortunate to have her,” stated Ms. Maxwell. Laine replaces Manjit Basi, the visionary and inspirational Ottawa citizen who co-founded Synapcity in 2011 and served as its first Executive Director. Manjit continues to focus on recovery from a concussion. She is much loved by her colleagues and the hundreds of people who have benefited from her ground-breaking work in civic engagement. The Board extends its gratitude to Manjit, our wishes for a speedy recovery and looks forward to welcoming her back in a suitable role when that becomes possible. For more information, contact Nickie Shobeiry at nickie@synapcity.ca or 613-288-5810.